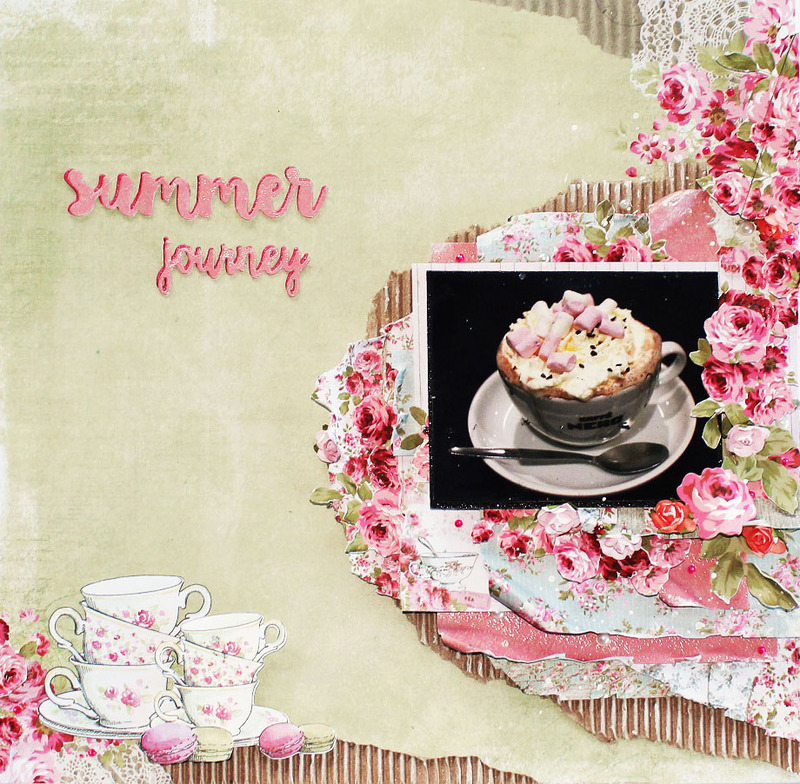 This is one of my layouts created for CHA - spring 2017 with the High Tea collection. The layout has been built up in layers with paper, fussy cut roses and corrugated cardstock. Start with the background paper BISCUIT. Tear of the corrugated cardboard pattern on the pater at the bottom part of the page. Also, cut out the small biscuits from the background paper. 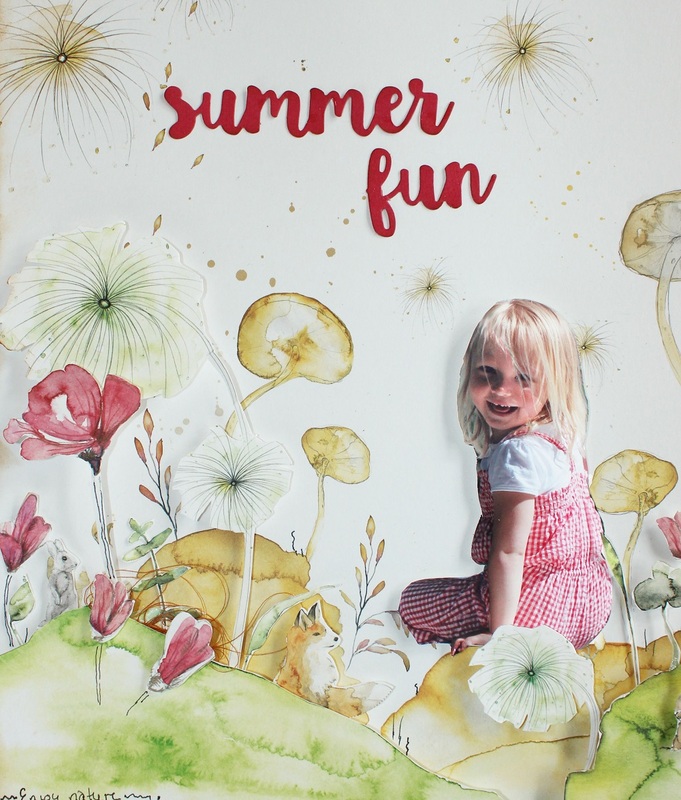 Add a piece of corrugated cardboard at the back, so the corrugated paper will show where the background paper has been removed. This is to create dimensions. 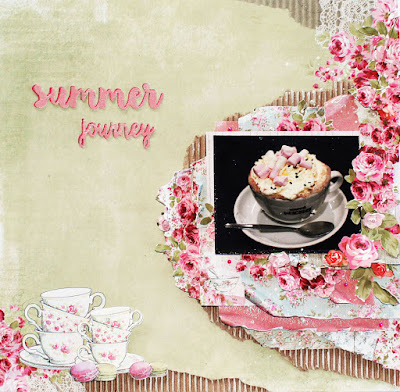 Add the teacups from the HIGH TEA collectables beside the teacups on the background paper. Add the cut out biscuits with 3D tape for dimension. Tear of a large piece corrugated cardboard, 22cm x 17cm (8 11/16” x 6 11/16”) shaped as a long half circle) and add it to the right hand side of the background paper. Add layers of papers from the HIGH TEA paper pad in different sizes on the right side. Add dimensions by using cardboard or 3D tape between the layers. 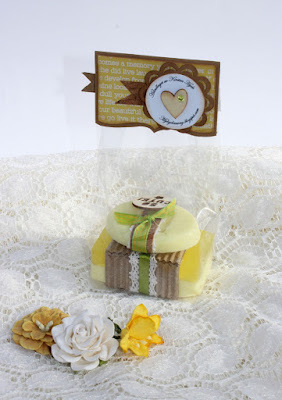 Add a piece of 12cm x 10cm paper from the HIGH TEA small paper pad behind the photo. The photo should be centred onto this paper. 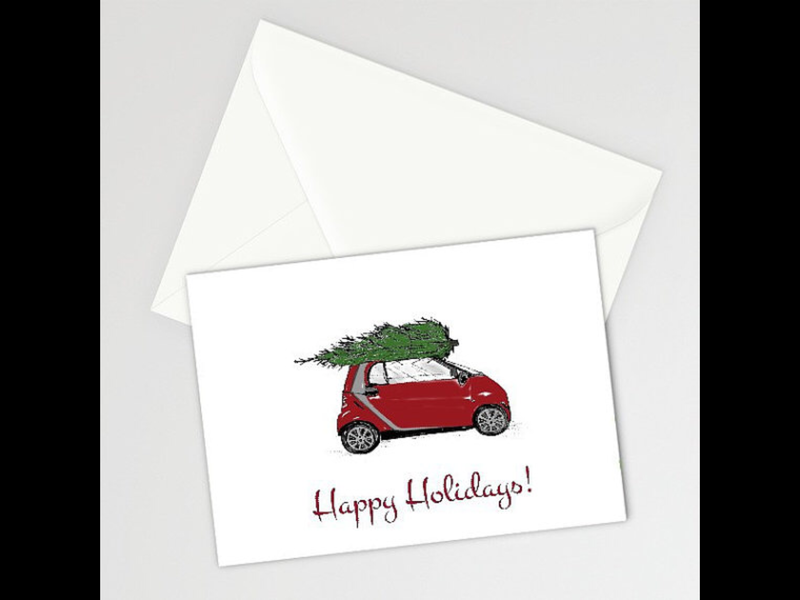 Add the photo and the paper to your page. Fussy cut all the roses from one of the rose pages in the HIGH TEA paper pad. Add the flowers in between the layers of papers on the right hand side of the page. Add the mini paper blooms, in between the layers. Use dies to create the text for the page. The text has been added in two layers, the background layer dark pink and front layer light pink. Cover the photo to protect it. Use the Kaisermist, take the mist top away from the bottle, and use it to sprinkle white mist over the page. Add pearls. Paint gesso as an effect onto parts of the corrugated paper on the page. 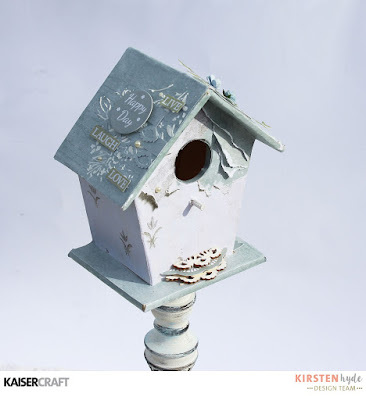 Kaisercraft products: High Tea Paper collection - P2278 Biscuit |PP1017 High Tea Paper Pad | CT879 High Tea Collectables | CB153 Corrugated Cardboard Sheets | Decorative dies – DD748 Summer words | DD771 Travel words | F646 Mini Paper Blooms – Buttercream KM111 Kaisermist – White | Pearls – SB713 White, SB788 Plum. 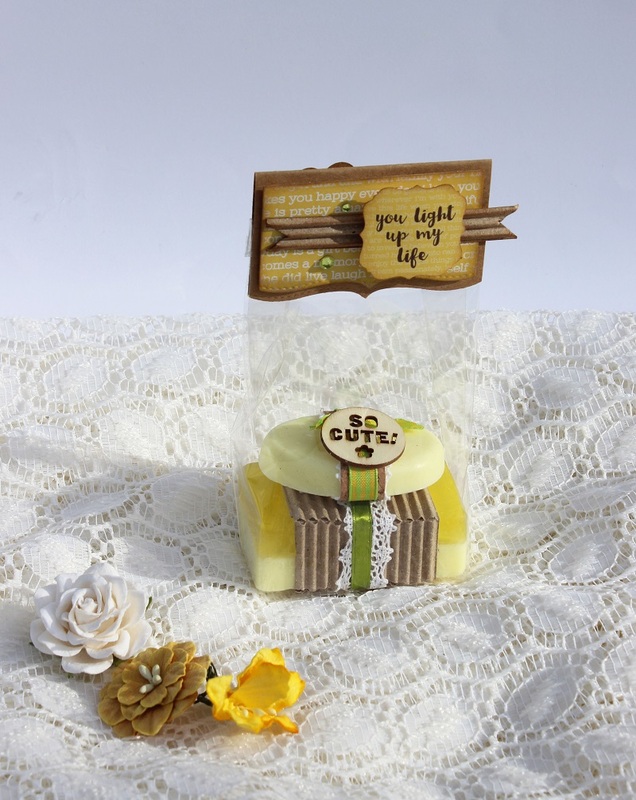 Hobbykunst has got some fantastic new products for creating soap. 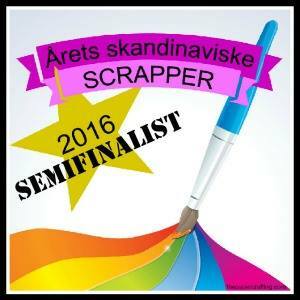 You can find soap base in 200 and 600g, soap pigments, Soap molds og different soap smells. These soaps are fantastic gifts, if you wrap them nicely. They are also a good idea for craft fairs. The wrapping, has been created with a cellophane bag. The bag has been cut open at the bottom and back and taped at the back to make it fit the two saps. It has also been taped at the vottom to close it. 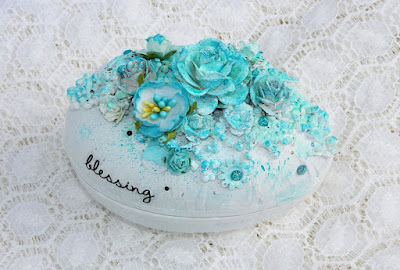 Around the soaps, I have used corrugated cardboard around the large soap, a lace and a ribbon. The top has been created using Kaisercraft's Keepers Finders kolleksjon and an edge die from Rayher. 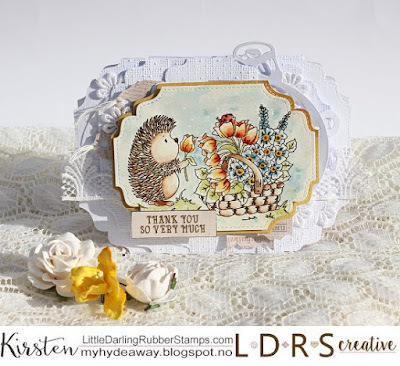 Kaisercraft's design team has shown different background stamps in Kaisercraft's blog. 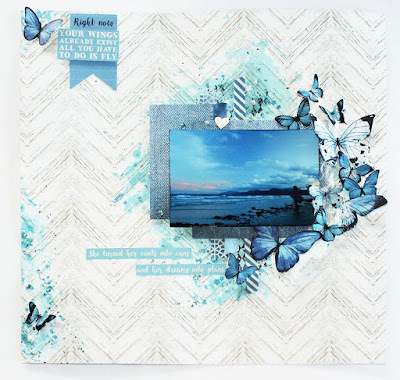 Here, I used the Indigo Skies collection, and created a summer layout. 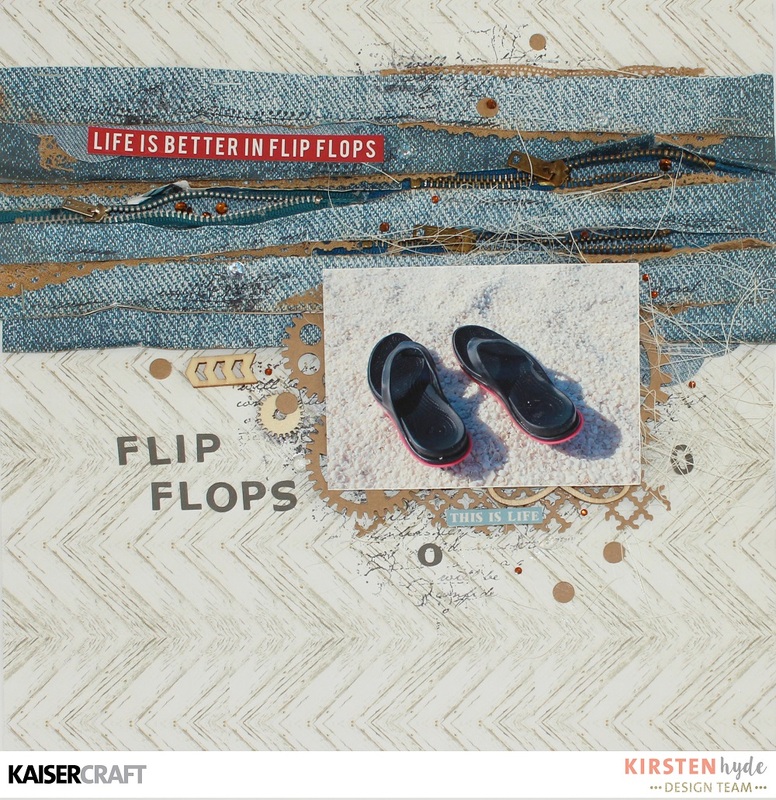 The jeans patterned paper, has been added in layers with lace and zips. 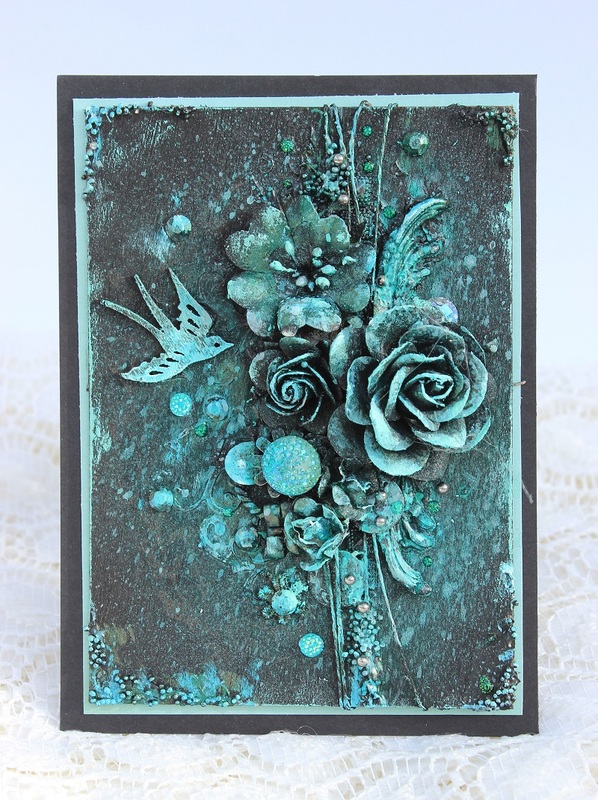 I have also stamped the background with different background stamps. 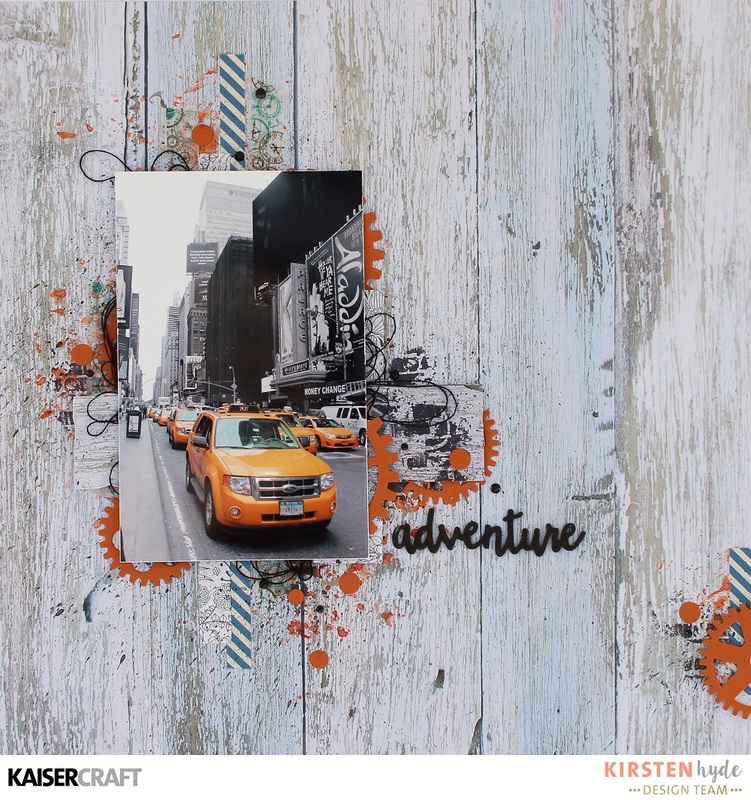 The photo has also been added in layers with layers of kraft gears and wooden flourishes. 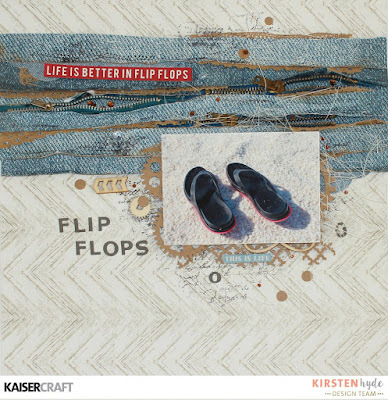 Kaisercraft Products: Indigo skies - P2289 Washed out | P2286 Chambray | CD651 Kraft Cardstock | EM928 Lace Pack Natural | RS404 Rhinestone Champagne | CS288 Critty | CS876 Texture Clear Stamp Cracle | CS257 Background Script Clear Stamp | FL599 Be You Flourish pack | FL597 Bloom Flourish Pack | FL580 Flourish Pack Cogs | DD706 Decorative Dies Cogs | DD434 Texture Lattis | AS251 Alpha Stickers Ebony. Art is often expensive to do. 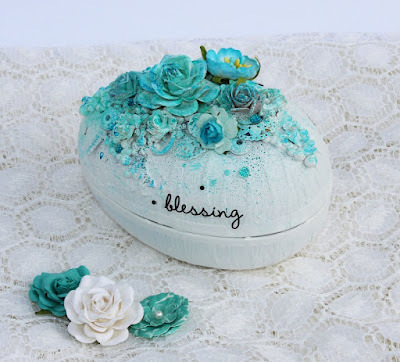 The paint, glue, pencils, mists, paints and embellishments, are often a huge cost. A few weeks ago, I got a craft magazine with some free emellishment pack. This had a few thin wooden pieces. I decided to a few mixed media pieces, out of the free wooden pieces. 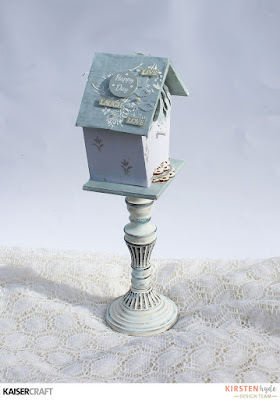 I then decided to only use left overs, from my craft room, to see what I could create without using a lof of money. Note: You do need good quality glue, paint, mists and paintbrushes. Do not save money on this. I added string around the wooden piece. 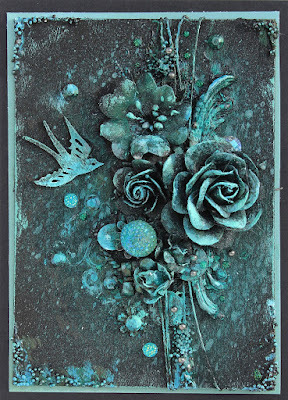 Then I glued on beads, metal and flowers. Then, the wooden piece was spray painted black. Then, I added Kaisermists in blue colours. After this had dried, I dry brushed with Finnabairs Art Alchemy acrylic paints - Sparks, Magical Pond and Metallique Emerald Green. I also added sprays of 13 arts golden mist. 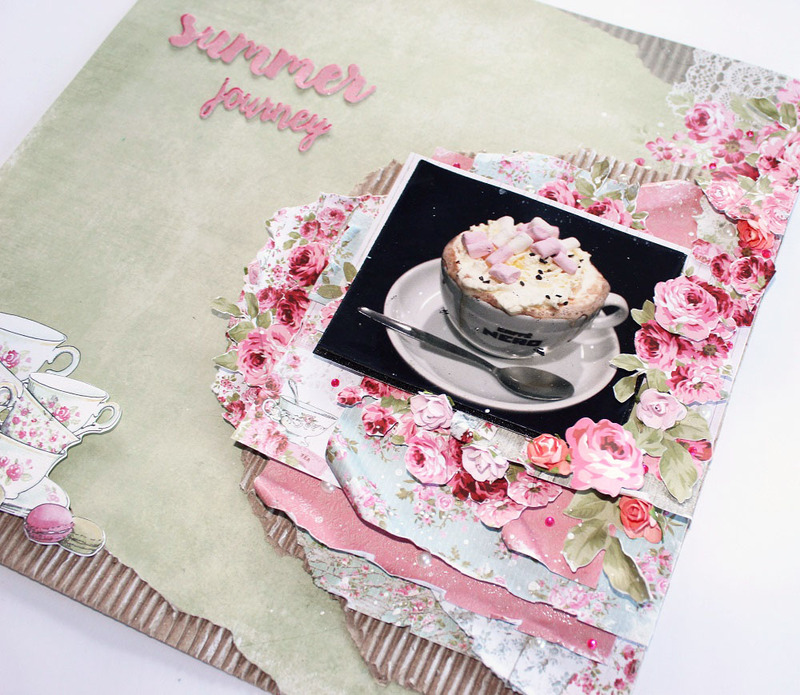 This is one of my 7 layouts shown at CHA - spring 2017. The photo is of Long Beach, (taken from Queen Mary), US. Start with the background paper SHIBORI. Make sure the stripes go sideways. Work on the top middle of the page. Stamp with the Background script and texture chevron stamp on the top half of the page. The stamping should just about be shown under the overlaying papers. Cut out a strip of 30cm x 12cm ( 12” x 4 ¾”) from the STORM paper. Add this to the top, middle of the page, sideways – from edge to edge of the paper. Glue with 3D tape or use cardboard in between the layers to create depth. 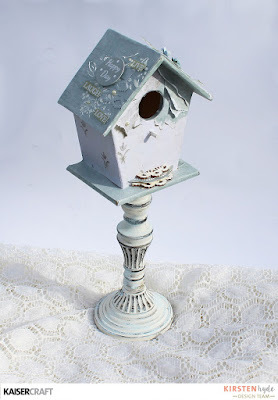 Add the white Chevrons, using the Designer template and gesso. 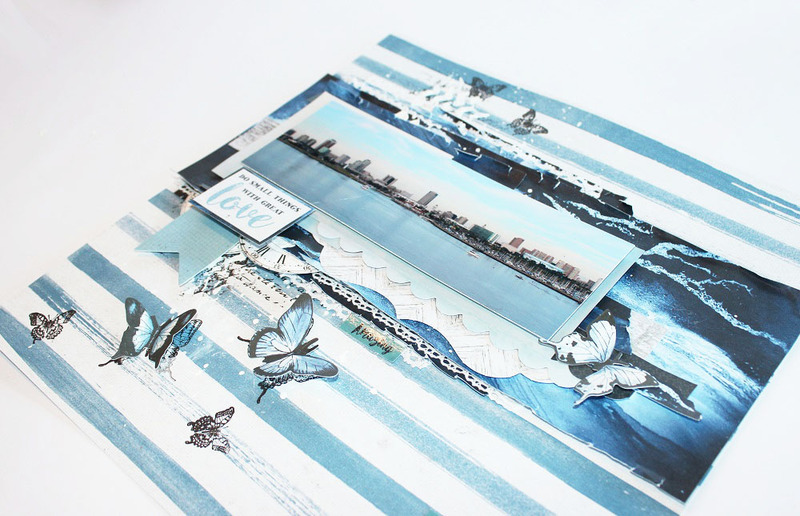 Cut out strips from the INDIGO SKIES paper pad. 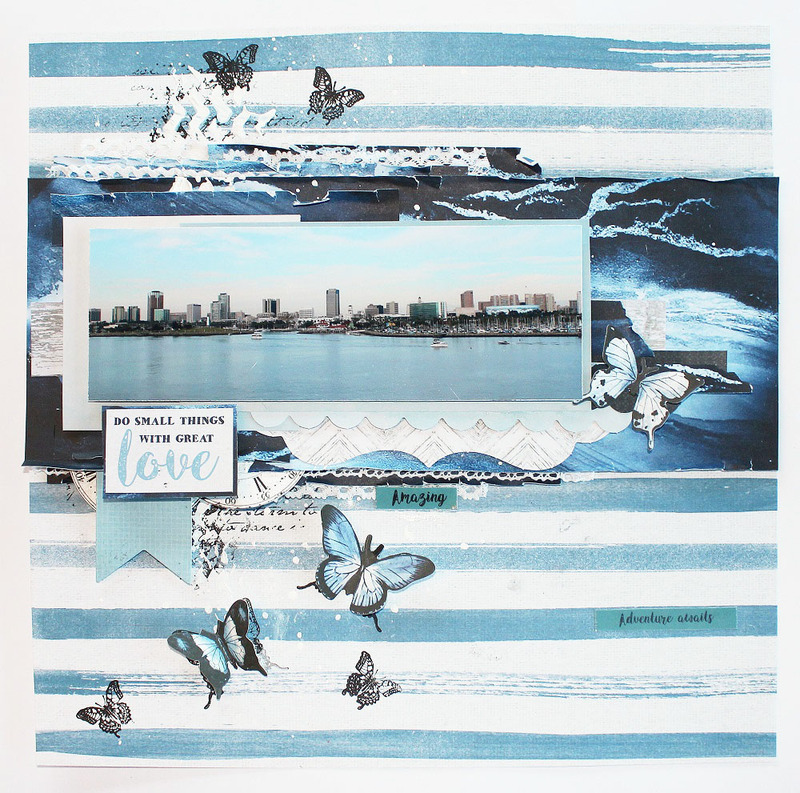 Add strips of papers to the top and bottom and top of the STORM strip, add them slightly to the side of the center. Adding them in several layers. Cut strips of lace, and add this in between the layers of paper strips. Cut a few rectangles of paper from the INDIGO SKIES paper pad, different sizes. Add the rectangles behind the photo, using 3D tape. Add the photo with the rectangles to the background. Add boarders from the INDIGO SKIES paper pad to the bottom of the photo. Take a clock out of the INDIGO SKIES collectables. Cut it in two and add the two parts under the STORM paper. Cut the Love quote from the BLUE MOON paper. Add a frame around the back of the quote with left over paper from the STORM paper. Add the quote to the left, bottom of the photo. Tuck a banner from the BLUE MOON collectables, under the quote. 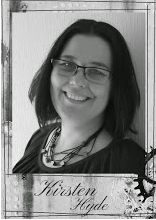 Cover the photo, and splat gently with the white Kaisermist over the page, using the inside spray end of the bottle. 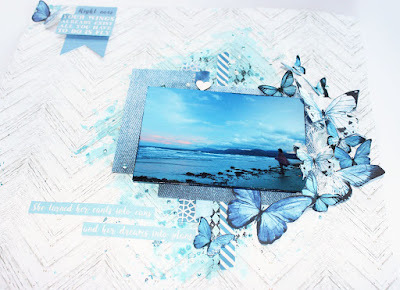 Stamp with one of the texture butterfly stamps, from the bottom left side to the top. Fussy cut butterflies from the BLUE Moon paper pad and CHAMBRAY paper. Add the butterflies to the page. 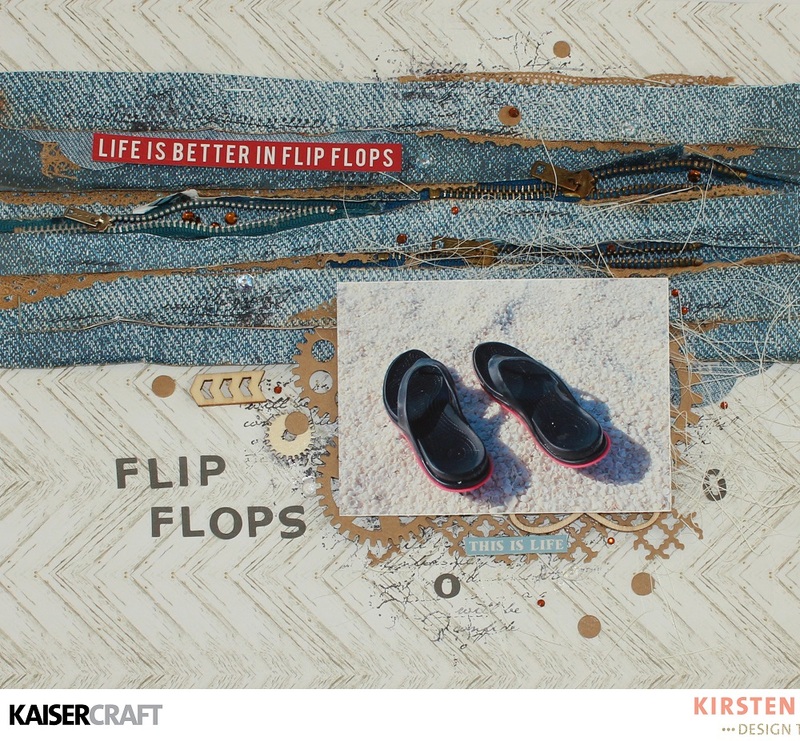 Kaisercraft materials: Indigo Skies Paper Collection - P2286 Chambray, P2287 Shibori, P2288 Storm, P2293 Blue Moon, P2294 Breeze | PP1018 Indigo Skies Paper Pad | CT880 Indigo Skies Collectables | EM926 Lace Pack | IT924 Designer template- Textures, Clear stamps - CS257 Background Script | CS149 Texture Chevron | CS854 Texture Butterflies | IP719 Small Ink Pad - Black. 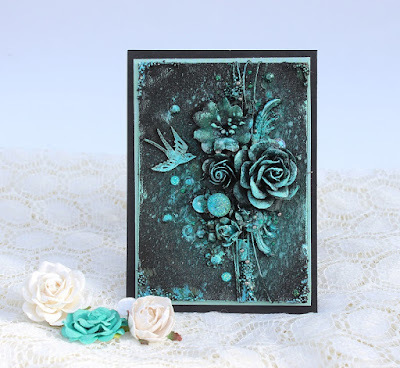 Have you ever looked at those shaped cards, and thought - I wish I had the right dies to create them? 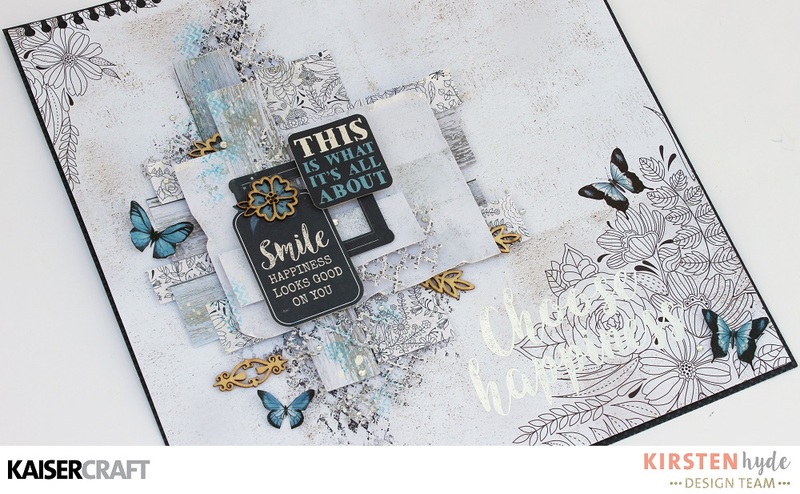 You can be creative with the dies you have got, and create shaped cards, just by layering the diecuts from dies you already have. 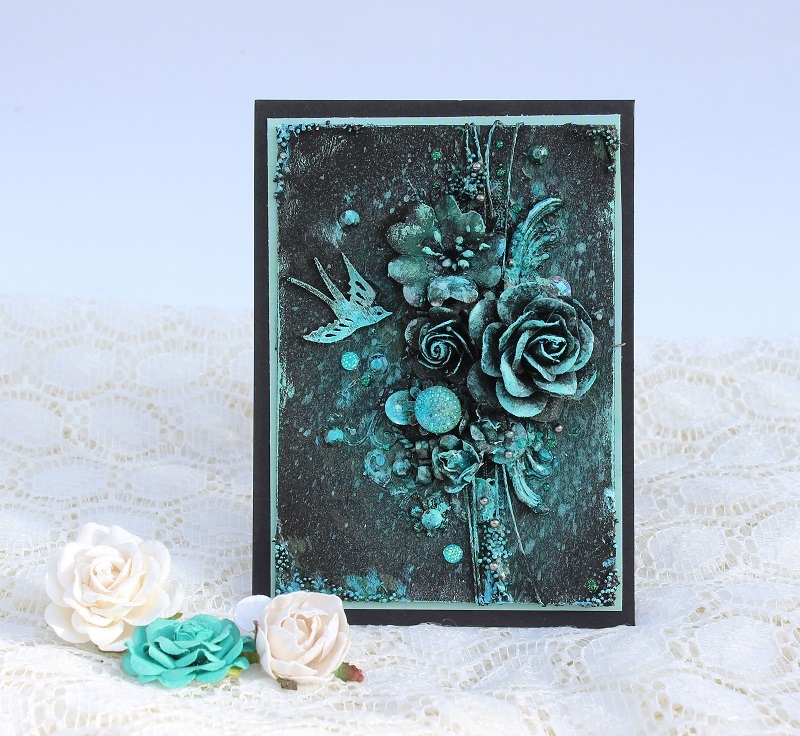 This card has been created with layers, upon layers with diecuts with the Fancy Rectangles and layers dies. 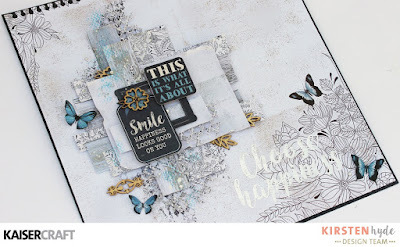 In between the layers, I have used lace, tags created with the same die set and a die cut of a clock, created with the Timeless Pocket watch die. The white cardtock at the front, has also got some pattern, created with the Picnic Quilt Embossing Folders set. 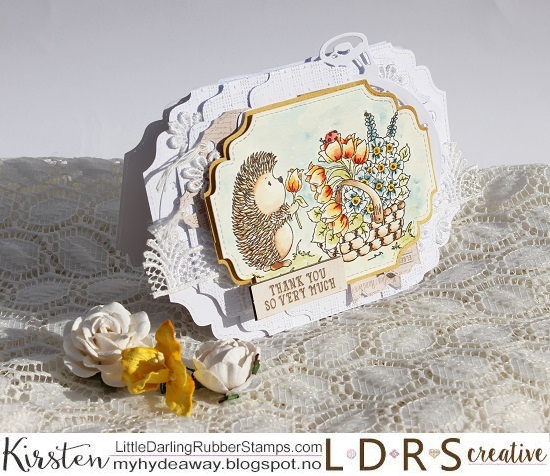 The stamp is the sweet Handpicked for Hedgy. We are showing masculine layouts in Kaisercraft's blog today. A few years ago, I went to New York. I had to take one of the classic photos of the taxies on Broadway. This is one of my favourite photos. The background has got fine mist with black and orange Kaisermist. Then, I have layered it with strips of paper and tape. I have also used orange gears, crated with Kaisercraft dies. 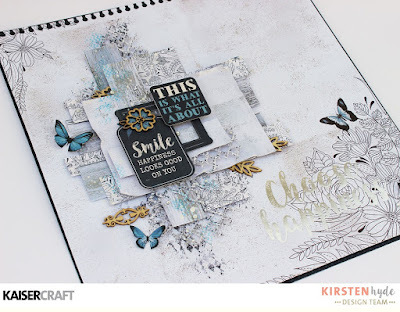 Kaisercraft products: Indigo Skies - P2290 | PP1018 Paper Pad | CS299 Brick Wall | KM108 Kaisermist Orange | KM101 Maisermist Charcoal | DD771 Decorative Travel Word Pack | PT211 Printed Tape Clocks | DD706 Decorative Dies Cogs | SB777 Rhinestones Black. Alexandra Renke has got a super sweet new paper collection otu in the shops. I have tested it out on a layout, created in dimentional layers. 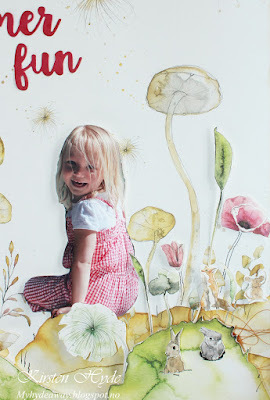 The pattern on the paper is plants, flowers, mushrooms and different nature creatures - painted in watercolours. Projects with these papers could be delicate and super sweet. 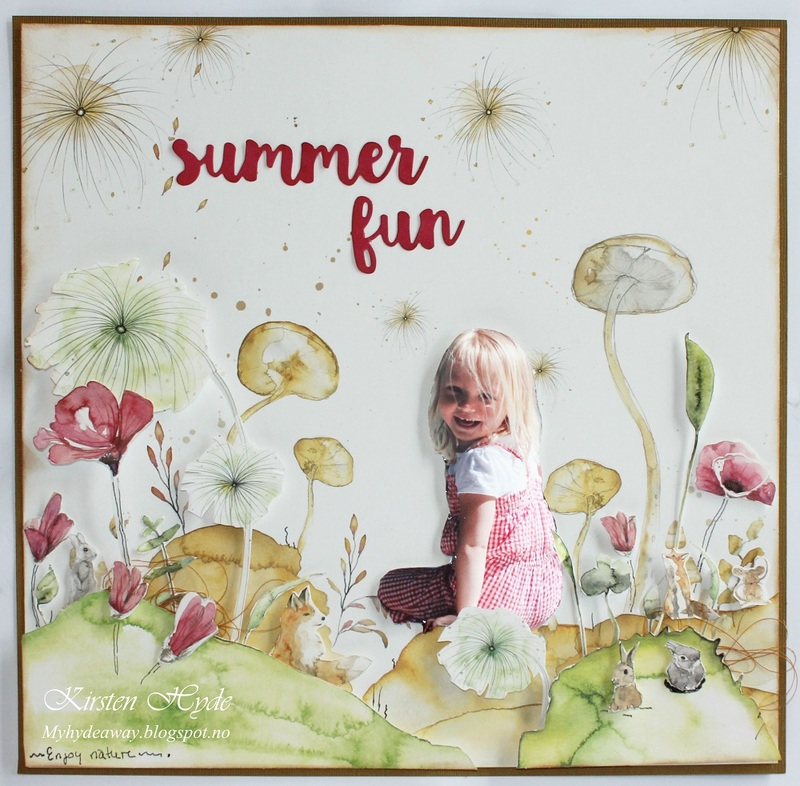 In this layout, the mushroom paper, has been used as a background. The grss, moss, leaves and flowers . has been fussy cut from the papers, and added in layers with 3D foam tape. The girl, has been fussy cut and glued on with 3D foam tape, to fit into the landscape. The word "summer fun" has been created with dies from Kaisercraft (DD748 Decorative Die Summer Words). Some sewing thread, has been used under the layers of grass, to create effect. Today, I am showing a spring project with the High Tea collection in Kaisercraft's blog. This is an altered wooden house and a candle stick, I had stored for some time. 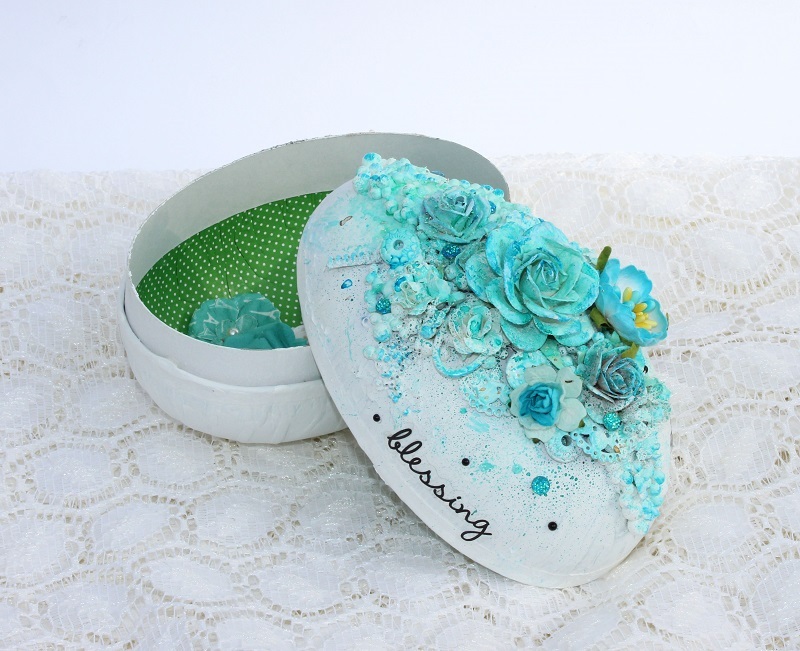 I have used the blue and white papers from the collection, together with collectables and wooden embellishments. The bird house, has been covered with paper, and then decorated. I used a stencil with gesso, to create some texture on the roof. Then I added strips of paper and collectables. 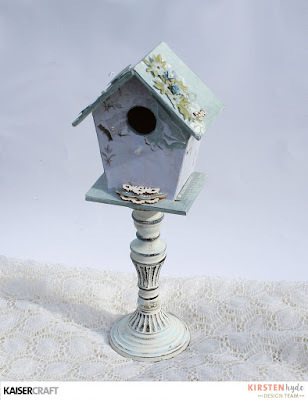 At the front of the house, I have added parts of a wooden embellishment, and layered it with a lace circle from the collectables. The candle stick has got a slight colour wash with light blue chalk paint. Part of the paper has a "ripped wallpaper effect". I enhanced this effect, with pieces of torn paper. 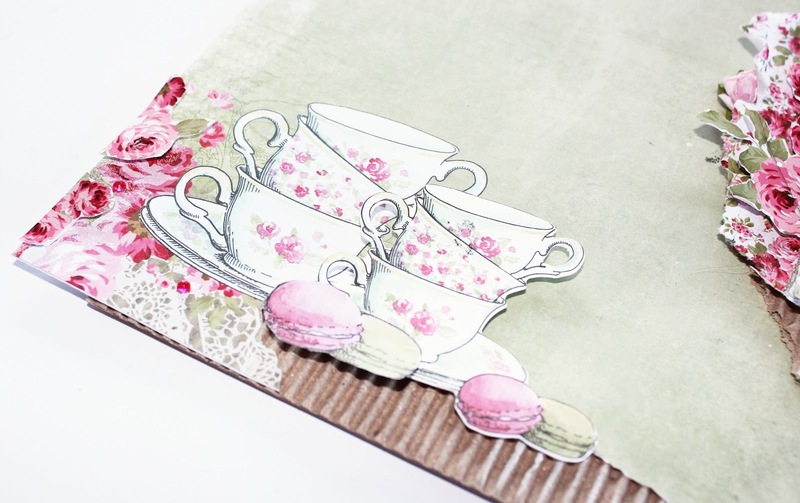 Kaisercraft products: High Tea - P2283 Cuppa | P2280 Tea Time | PP1017 Paper Pad | CT979 Collectables | FL598 Tea Party Flourish Pack | FL599 Be You Flourish Pack | SB713 Pearls Pearl | IT435 Botanical. Today, I am showing a layout created with the Indigo Skies collection for Kaisercraft's stand at CHA - 2017. The photo, was taken in Port Douglas, in Australia, 10 years ago. 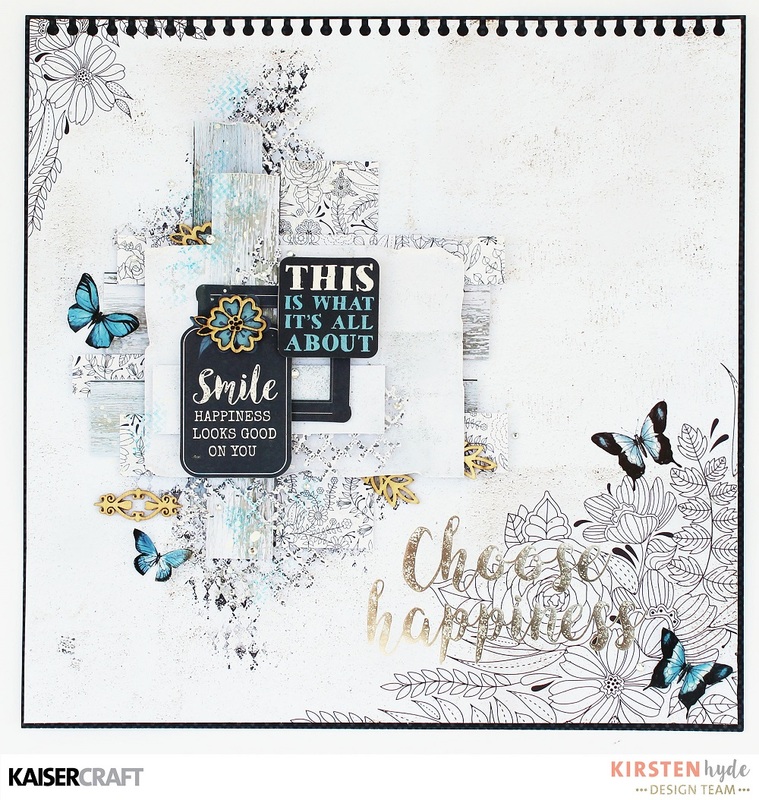 The layout is full of butterflies, colours created with Kaisermists and quotes. Photo: 12,5cm x 8cm (4 15/16” x 3 1/8”). Start with the background paper. Spray water onto the paper. Spray the mists onto cling film. Tab the cling film onto the background paper in the middle, the bottom left side corner and top left side corner. If the colours are strong, spray on some water. Let dry. Iron the page, to make it flat again. Stamp over the background with the Texture diamond stamp, in places. Cut strips of paper from the INDIGO SKIES paper pad. Also, cut of the bottom strips of the page MISTY (reverse). Add the strips of paper to the middle, right side of the page. 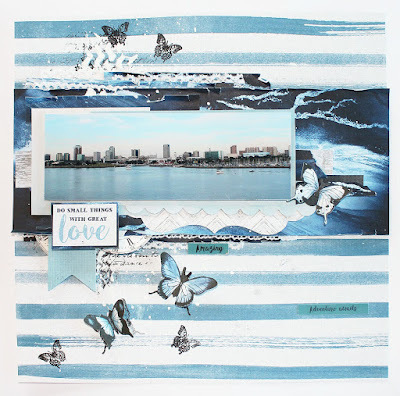 Cut two rectangles, 9cm x 8cm, from the denim paper in the INDIGO SKIES paper pad. 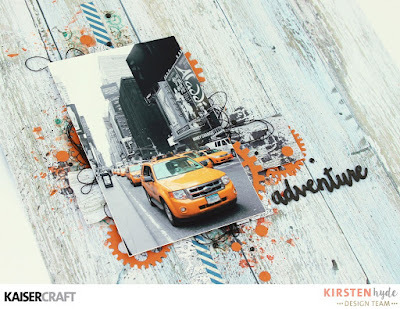 Layer the rectangles and glue them to the photo, using 3D tape for depth. Add the photo, with the rectangles to the background. 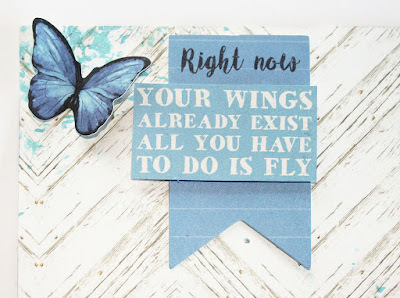 Cut the “Your wings” quote from the BLUE MOON paper. Glue this to the top of the “Right Now” banner from the INDIGO SKIES collectables, using 3D tape for depth. Glue these to the top left hand side of the page. Fussy cut butterflies from the CHAMBRAY paper and the butterfly paper in the INSIGO SKIES paper pad. Add them to the page. Add pearls. Use the text on the boarder from the WASHED OUT paper (reverced), and add this to the layout. 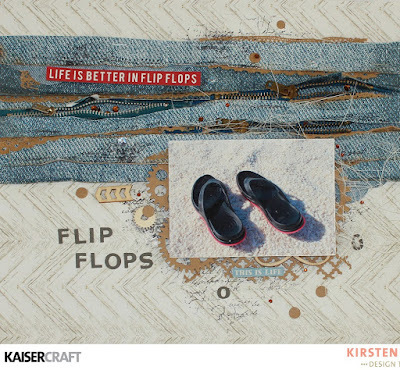 Kaisercraft products: Indigo Skies Paper Collection - P2286 Chambray, P2289 Washed Out, P2290 Misty, P2293 Blue Moon | PP1018 Indigo Skies Paper Pad | CT880 Indigo Skies Collectables | Kaisermists - KM116 Aqua, KM106 Denim, KM111 White | SB713 Peals – Pearl | RS402 Rhinestones Island Lagoon | FL590 Flourish Pack - Love (Heart) | CS152 Clear Stamp - Texture Diamonds | IP719 Small Ink Pad - Black. Kaisercraft is out with a new challenge. 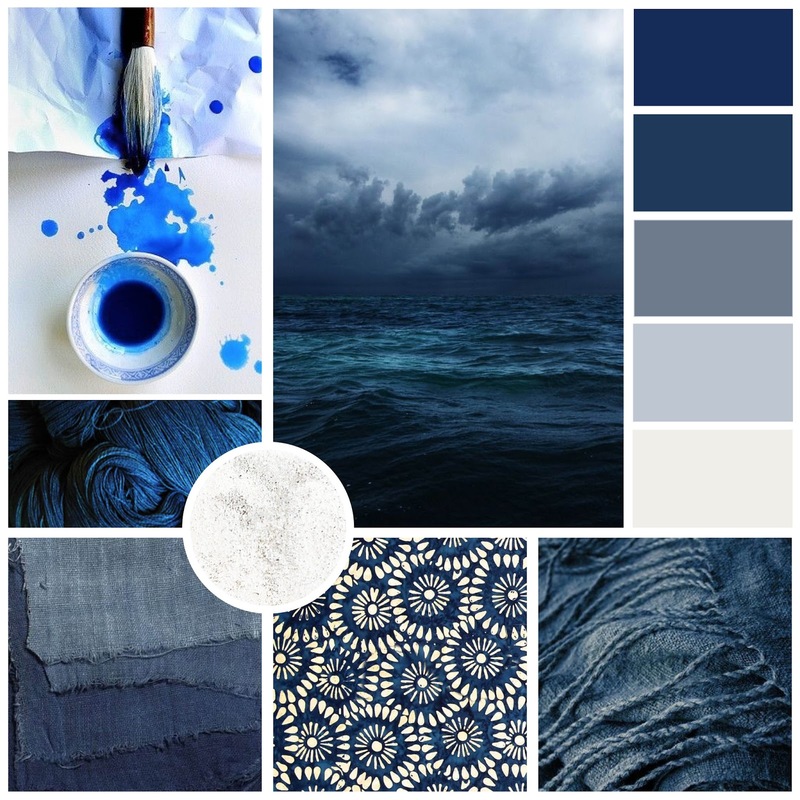 This time, the challenge is a Mood Board. 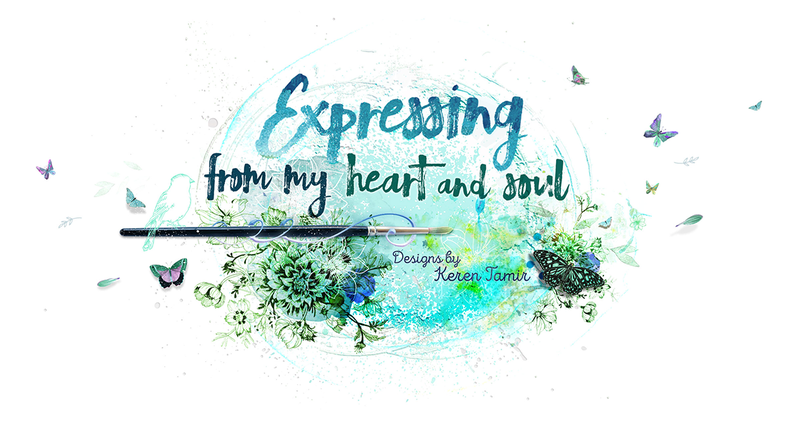 I have created a layout, with quotes from the Collectables in the Indigo Skies collection, instead for a photo. 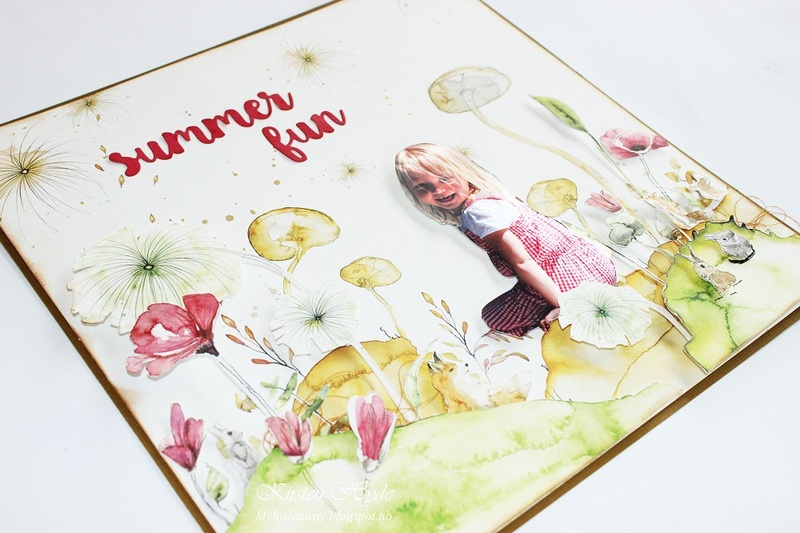 The die cut Specialty paper, has been used as a base for the layout. 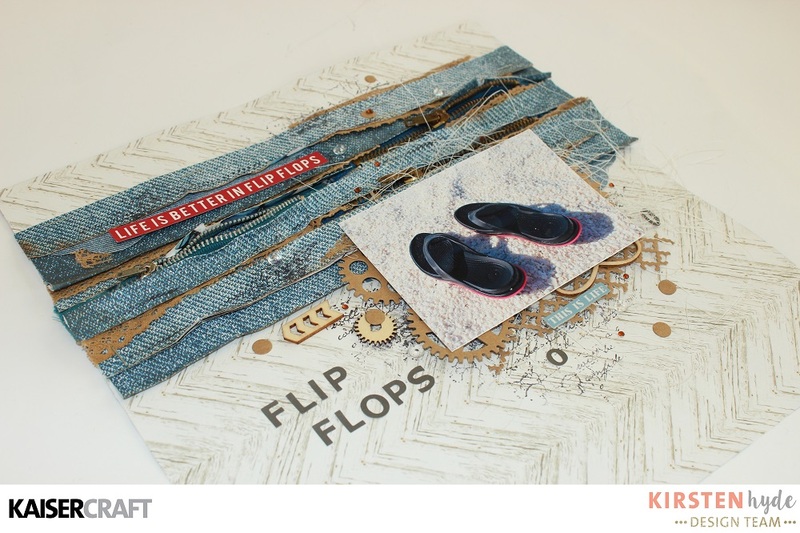 Strips of papers from the small paper pad, has been added in layers, with die cuts and wooden flourishes. Mists and stamped effects has been added to the background. 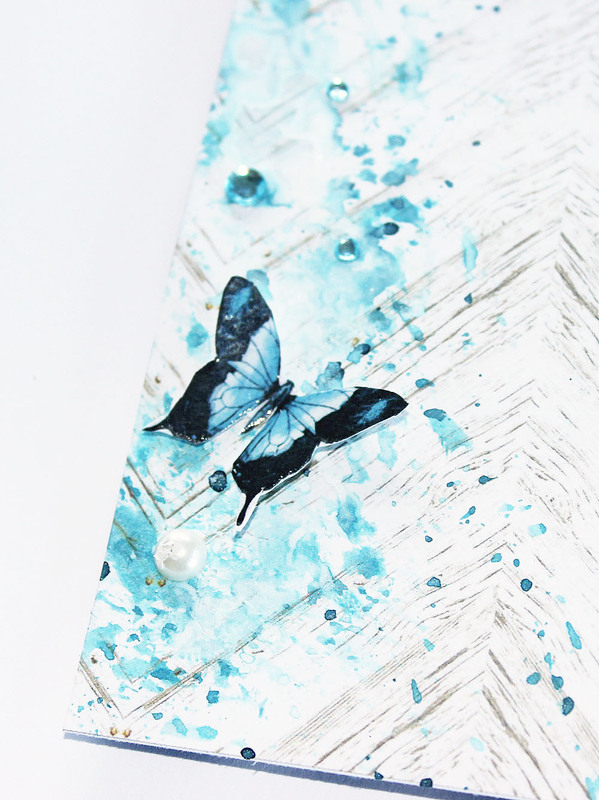 Small butterflies, cut from the paper pad, has also been added. 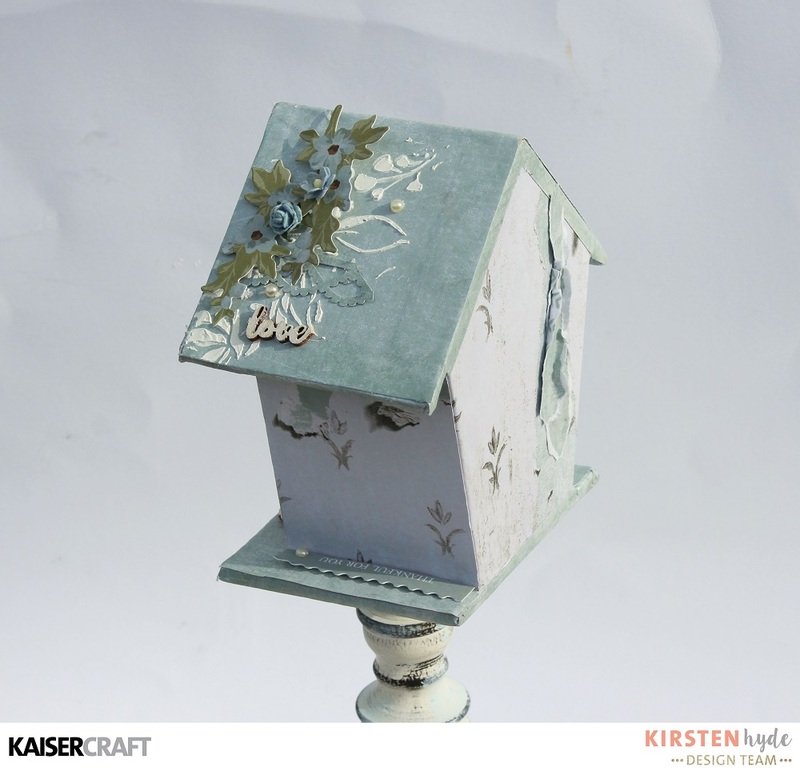 You can enter the challenge in Kaisercraft's blog. Kaisercraft products: Indigo Skies - PS486 Choose Happines Die cut | P2291 Midnight | PP1018 Paper Pad | CT880 Collectables | FL599 Be You Flourish Pack | KM106 Denim Kaiser Mist | KM116 Aqua Kaiser Mist | KM111 White Kaiseser Mist | DD434 Texture Lattice | CS152 Texture Dimonds Clear Stamp. Easter is soon going to be here. This year, I have only decorated a few Easter eggs. This is one with my favourite colours, white and blue. The Easter egg has been created with a simple cardboard Easter egg. 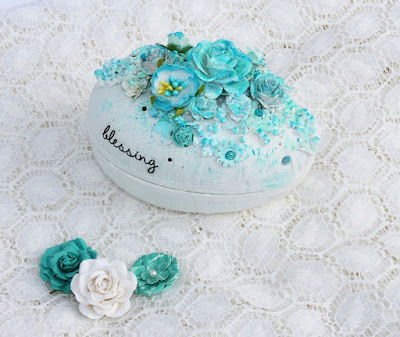 Flowers and embellishments has been added, and then it has been spray painted white. The flowers has then been spray painted blue and dry painted with white and blue. The mists are from 13 arts and Kaisercraft. Paint from Finnabair's collections. The little text "blessing" is a sticker from Kaisercraft.